Thermodynamic irreversible process is defined as the process in which the changes take place rapidly, instead of occurring in successive stages with infinitesimal changes in quantities so that the system does not get a chance to attain equilibrium and there is an appreciable difference between the driving and the opposing force. I have some problems in understanding it. Which equilibrium are they speaking of? Why does rapidity of the change cannot help it to attain equilibrium (how does an infinitesimal change in a reversible process help it to reach equilibrium)? What does they want to mean by driving and opposing force? An irreversible process is one in which the net entropy generation term is greater than zero. All real processes are irreversible. The "process speed" comes into play when we want to make approximations for idealized systems. It turns out that one way to convert a process into a theoretically reversible one is to set the condition that it moves very slowly between thermodynamic states, so that at any given step, it is in equilibrium. The reason that this isn't a good definition for a reversible process is that there are cases where a rapid change is reversible, and cases where a very slow change is irreversible. It's just that in general use, the "very slow process" approximation is commonly used to obtain a reversible process. This is an example of an internal equilibrium - the particles cannot cross the system boundary, but they can reach an equilibrium within the system. 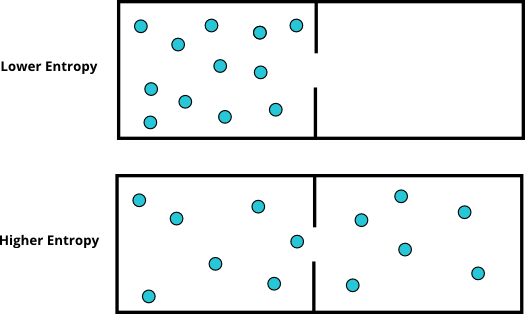 An example of a system in equilibrium with its surroundings would be a container filled with water at room temperature - there are no thermal gradients across the container boundary. Why does rapidity of the change prevent it from attaining equilibrium (how does an infinitesimal change in a reversible process help it to reach equilibrium)? Whenever a system is perturbed, meaning moved away from an equilibrium state, it takes some amount of time to reach a new equilibrium. This amount of time is called the relaxation time. Different systems have different relaxation times, and if you make changes quickly enough, the system won't have time to relax, and therefore won't be in equilibrium. Using a piston in a cylinder as an example, if you compress the piston by a very small amount, then the pressure inside will be in equilibrium with the pressure outside almost immediately. What do they mean by driving and opposing force? Using the piston as an example again, in this case the driving force would be the external pressure on the piston. The opposing force would be the pressure of the gas inside the cylinder. For a very slow process, at any given time the outside pressure and inside pressure would be the same - the volume would change to make sure this is true. For a very rapid change, the gas inside the cylinder would take longer to reach equilibrium, and so the pressure outside would not equal the pressure inside - the driving and opposing forces would not be equal. It is important to remember that these are approximations that are intended to allow us to convert really difficult (usually unsolvable) differential equations that describe non-equilibrium or dynamic systems into something that is solvable. The trade-off is that we go from a realistic, fully dynamic system to one with constraints - we treat it like a series of tiny jumps between systems that are in equilibrium. In many cases, these approximations don't affect the accuracy of the solution. However, whether or not it will is determined by the time scale of the change relative to the relaxation time of the system. I'll try and somehow answer this backwards. 3) Driving and opposing forces: Each process is driven by some kind of 'force' (please do not understand 'force' in the traditional physical sense; it's more of 'reasoning, why something would want to do something'). For example, when having a saturated sodium chloride solution, the sodium and chloride ions that are still bound in their ion structure in the precipitate would like to dissolve, the driving force being the increase of global entropy by a greater disorder of the entire system. On the other hand, every process also has an opposing force, that attempts to force the process back into its original state. In the case of the saturated sodium chloride solution, the opposing force would probably be something along the lines of releasing water molecules out of a solvation shell, and thereby increasing local entropy. Finally, for an (essentially) irreversible process, like the reaction of hydrogen and chlorine to form hydrogen chloride gas: This is a radical chain reaction. For each reaction step (formation of chlorine radicals, homolytic cleavage of hydrogen by a chlorine radical to form hydrogen chloride and a hydrogen radical, homolytic cleavage of chlorine by a hydrogen radical to form hydrogen chloride and a chlorine radical, and finally radical recombination in whichever combination) there are of course driving and opposing forces. However, the driving force is usually much stronger than the opposing force. For example, while it is energetically favourable to cleave a chlorine molecule with a hydrogen radical to form hydrogen chloride and a chlorine radical, a chlorine radical would never attack hydrogen chloride to liberate a hydrogen radical as HCl is far more stable than either hydrogen or chlorine. 2) The smaller and less rapid a change happens—in our case, dissolving one pair of sodium and chloride is a very small change—the easier it is to just go the other way. If a change is 'rapid' (I don't really like the word here, but I'm not good enough to find a better one), then obviously the driving force is stronger than the opposing force, creating a bias towards the product side. 1) Any process can be understood as a dynamic one, with the change happening in both forward and backward direction. So even if you were to burn methane—clearly an irreversible process—you can still consider very minute quantities of carbon dioxide and water recombining to form a methane molecule or two (and oxygen). You won't, however, observe a proper equilibrium between methane/oxygen and carbon dioxide/water. So while reversible processes are always at equilibrium between one side and the other side, irreversible processes are shifted so far to one side, that it doesn't really make sense to define an equilibrium for them, i.e. they 'do not get a chance to attain equilibrium'.